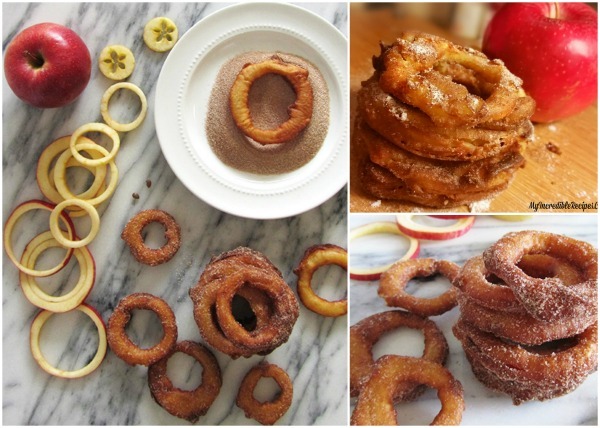 Everyone who knows me knows that I am a sucker for two things (ok, there are more, but I won’t bore you today): crispy onion rings and apple desserts. So it’s probably not all that difficult to imagine my wide-eyed, squealing of delight when I stumbled upon this recipe that, lo and behold, combines two of my absolute favorite guilty pleasures. Sometimes life really can just be the greatest. Cover image sources and other yummy twists to this cinnamon apple ring recipe: Fryday: cinnamon apple rings – Fortunegoodies, Cinnamon sugar apple rings – Myincrediblerecipes. Peel and slice your apples to your desired thickness, then cut out the middle cores – thin cuts mean mushy apples and thicker gives you more of a bite, so it’s up to you. In a bowl, combine the egg yolk and vanilla, and whisk. Add the water and whisk. Add the flour and whisk again. Add the salt and give it one last whisk. In a smaller bowl, mix your cinnamon sugar to be used as a topping afterwards (I like to add lots of cinnamon!). Heat up the oil in a pot, then dip the apple rings in the batter and carefully drop them into the oil. Once crisp, remove the apple rings – they’ll still look rather pale in color. Sprinkle them with your cinnamon sugar mix and pop them into the oven at 400°F (about 200°C) for about 10 minutes, or until golden brown. Eat warm and enjoy your fantastic sweet and crispy apple rings! Feel free to add some vanilla ice cream. If you’ve got some apples left over and want to make something else that’s just as delicious, give this apple puffed pancake a try. And if you’re serving these to guests and want to impress them even further, decorate the serving plate with a little food art – an apple slice swan!